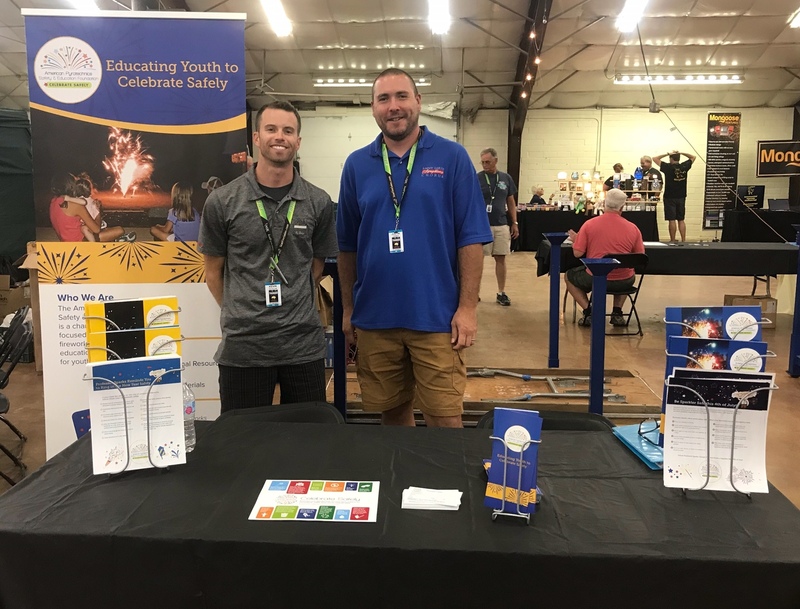 The American Pyrotechnics Safety & Education Foundation is a 501 c(3) charitable organization focused on creating fireworks safety and education programs for youth. The goal of this education initiative Celebrate Safely, is to instill in young people an understanding of how consumer fireworks should be used appropriately, discourage the misuse of fireworks, and decrease the number of fireworks-related injuries in the U.S.
Foundation leaders promoted its safety initiatives with members of the Pyrotechnics Guild International (PGI) during their annual convention in Mason City, Iowa. Significant interest was generated among the PGI membership and we are pleased that PGI President Paul Smith and 1st Vice President Dr. John Steinberg were recently named to serve on the Foundation Board. We are grateful to have their expertise and passion to assist in the Foundation in its efforts to educate youth to celebrate safely. 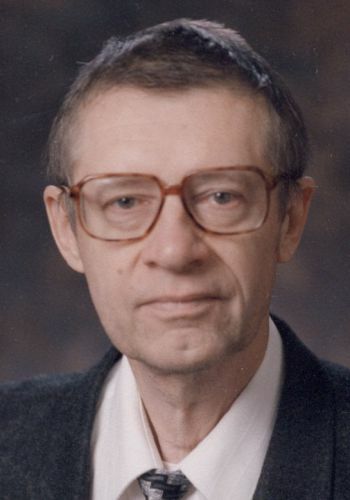 When the industry lost Michael Oetken, co-founder of J&M Displays, his family wanted to memorialize his passion for fireworks and dedication to safety. To keep his legacy alive, they urged friends & family to donate to the Foundation in his name. Others are encouraged to remember the Foundation in their estate planning. Learn more. The APA’s Safety & Education Foundation received a pleasant surprise during this year’s Annual Convention in Cleveland. Ron Zoldan and Jessi Moore of Phantom Fireworks presented Foundation President Kevin Gilfillan with a check for $110,000, proceeds from a point-of-sales promotion they initiated this past season. In its first year, the Foundation’s “In the Bag for Safety” campaign was successful in distributing over 1 million shopping bags that included the Foundation’s Celebrate Safety tips - generating over $2,500 in contributions. 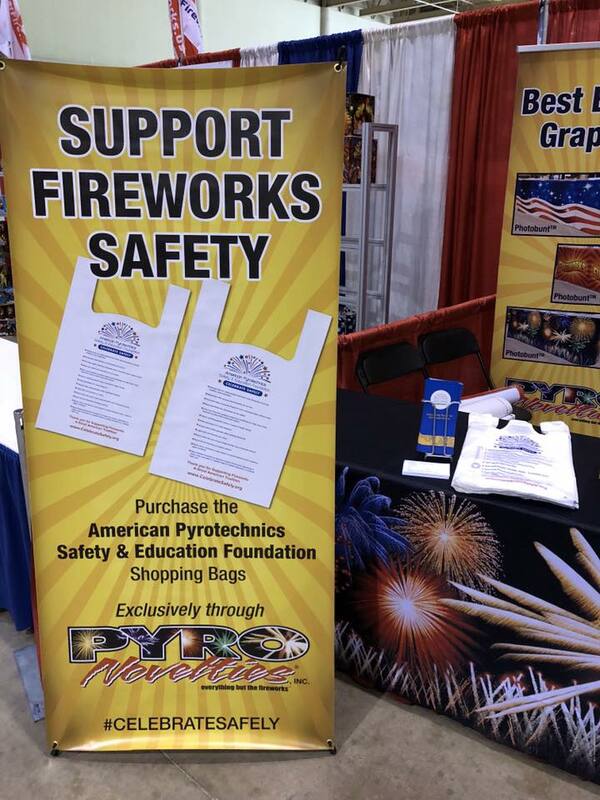 Created in partnership with Pyro Novelties, the bags come in two sizes and have a red & blue patriotic theme. We urge retailers to consider supporting the Foundation in 2019 by ordering their bags early Please visit the Pyro Novelties wholesale website for more information. 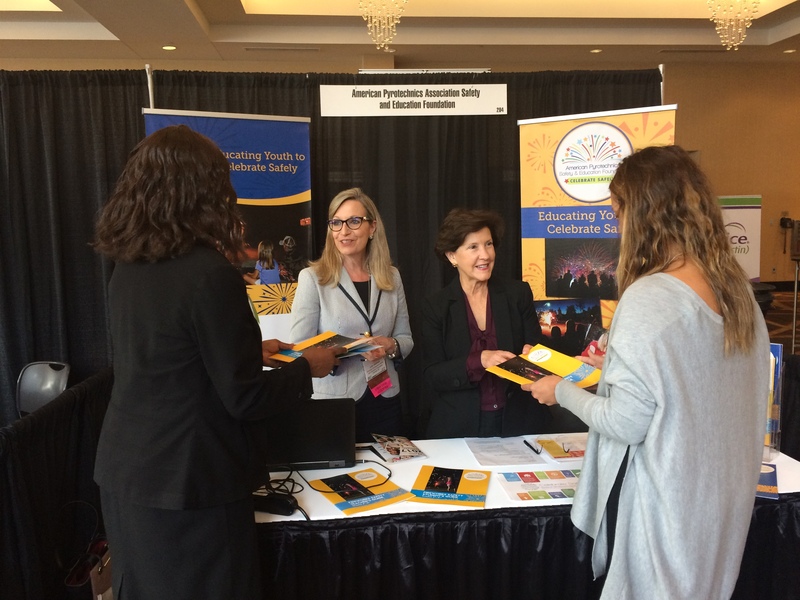 Foundation advocates Julie Heckman and Inez Tenenbaum meet with members of the American School Health Association at their convention in St. Louis. APA's Foundation is providing resources to educators to assist them in teaching young people to #celebratesafely -- efforts made possible by the generous contributions of APA members!